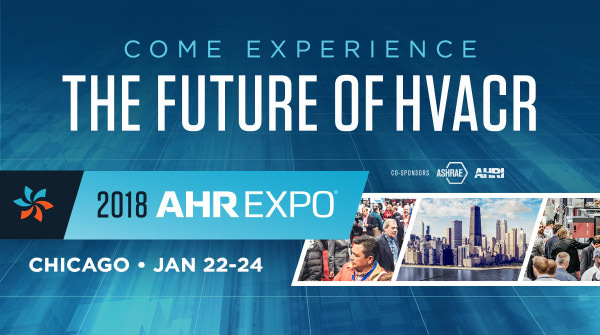 We are thrilled to be heading to Chicago in January to be apart of the 2018 AHR Expo being held at the McCormick Place, 2301 S. King Dr, Chicago, IL 60616, from January 22 – 24, 2018. We invite you to stop by the Infloor Heating Systems exhibit booth #8149, where we will be talking about our radiant heating systems and the many great products and applications we provide, including our new stainless steel manifolds and Hydrofill, and the systems we design and recommend for your application. This is a great opportunity to learn more about our systems and ask any questions you have. No one knows more about radiant heating than we do. Approaching its 86th year, the event hosts more than 2,000 exhibitors and crowds of 65,000 industry professionals from every state, to come together and share new products, technologies, and ideas. Learn more in the short VIDEO trailer below, or click HERE.